ISLAMABAD:(APS) April 4, 2018-Federal Minister for Education and Professional Training, Engr. Muhammad Baligh Ur Rehman has said that no one can deny the importance of languages and it is very essential to learn and value the languages. The Federal Minister was addressing as Chief Guest at the National University of Modern Languages (NUML) Convocation-2018 here on Wednesday. He said that the learning of different languages enhances the critical and analytical ability of a person. The Federal Minister congratulated the graduating students and their parents. Baligh Ur Rehman said that today’s Pakistan is much better and the future of Pakistan is bright. Pakistan is a peaceful country and we have come out of the extremism and terrorism. Our armed forces, civilians, police and other law enforcement agencies rendered great sacrifices in war against terrorism. We pay tribute to shuhada, he said. The Federal Minister said that it is the peace which leads any country towards development and progress. He said that the economy of Pakistan is booming today and CPEC is leading Pakistan towards development. Today there is no power load-shedding in Pakistan, new industries and business are being established. The Federal Minister said that work is underway on coal, hydel and nuclear energy plants in the country. He hoped that power plants will run from the coal of Thar in this year. Baligh Ur Rehman said number of steps are being taken for the betterment of education sector in the country and allocations for education sector has also been increased. He said that no nation can progress without education. He noted that number of the out of school children phenomenally reduced and enrollment has increased in the country. The Federal Minister said that number of programs have been launched through Higher Education Commission (HEC) such as laptops program. Baligh Ur Rehman said that alongside education, training is also very important. He said that our youth will have to become life-long learner in this age of technology by acquiring knowledge through e-libraries and e-journals besides books. He said that our youth will have to make their character strong and they should now the difference between right and wrong. Character building and positive attitude are very important and it is the positive attitude which take any person towards progress and success. The Federal Minister advised the students to always keep positive attitude; do good to others and try to understand other’s point of view. He asked that students to show their gratitude towards parents, teachers, peers and society. He said that our youth must have purpose in life and they must do everything with hard work and in better way. The Federal Minister said that students should learn the soft and leadership skills. FEDERAL MINISTER FOR EDUCATION AND PROFESSIONAL TRAINING, ENGR. 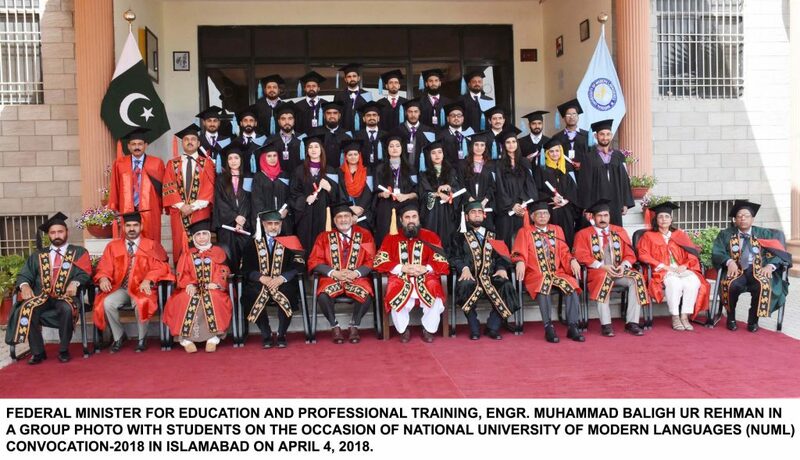 MUHAMMAD BALIGH UR REHMAN IN A GROUP PHOTO WITH STUDENTS ON THE OCCASION OF NATIONAL UNIVERSITY OF MODERN LANGUAGES (NUML) CONVOCATION-2018 IN ISLAMABAD ON APRIL 4, 2018.